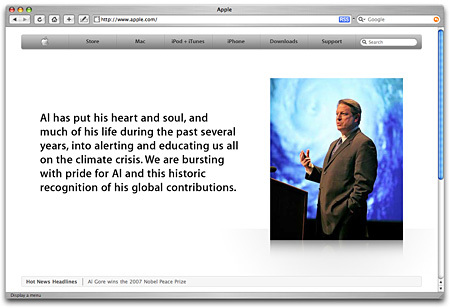 Apple.com – Steve and Al’s Personal Platform? Hey, Republican. Do you want to see the Nobel Peace Prize I won for my work on global warming and the important environmental issues I continue to champion? I have a better idea, Democrat. Why don’t you tell us again how you invented the Internet? Hehe. That’s not nice, Republican. You know that comment was taken out of context. So you don’t want to hear how I’m saving the planet? Hey, if Apple comes out with a low voltage, 80% recycled and recyclable GoreBook Pro, I’ll be the first in line to buy one. This entry was written by Brian McNitt, posted on at 5:44 pm, filed under Business and tagged al gore, apple, environment, gore, mcnitt, nobel peace prize, politics. Bookmark the permalink. Follow any comments here with the RSS feed for this post. Post a comment or leave a trackback: Trackback URL. I’m a consumer electronics designer and manufacturer who’s been in many environmentalists’ crosshairs in the recent past for how my company does (or doesn’t, as the allegations go) handle waste and byproducts, packaging, etc. I wonder, is there some way I can get some cheap PR mileage by riding on Gore’s coattails? Whatdya know – there is! Who does the gift benefit more – Gore or Apple?